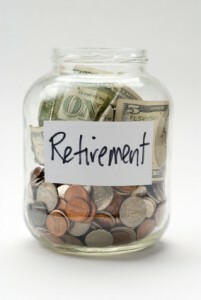 How much do you need to save every week or month to become a retirement savings millionaire? Most people cannot even dream of saving this much money or ever having a million dollars, yet many consumers do it all of the time because they have focused on managing their money in such a way that they are able to deal with all of their expenses and still save money. In this post we will do a few calculations to show you just how easy it is to become a retirement millionaire and also the major advantage of starting early in life to save for retirement. The chart below demonstrates several fundamental rules. The earlier you start saving and the longer you save, the more money you will have for retirement. For example if start at age 20 and save $150 a week, you can easily have one million saved by the time you are 55. 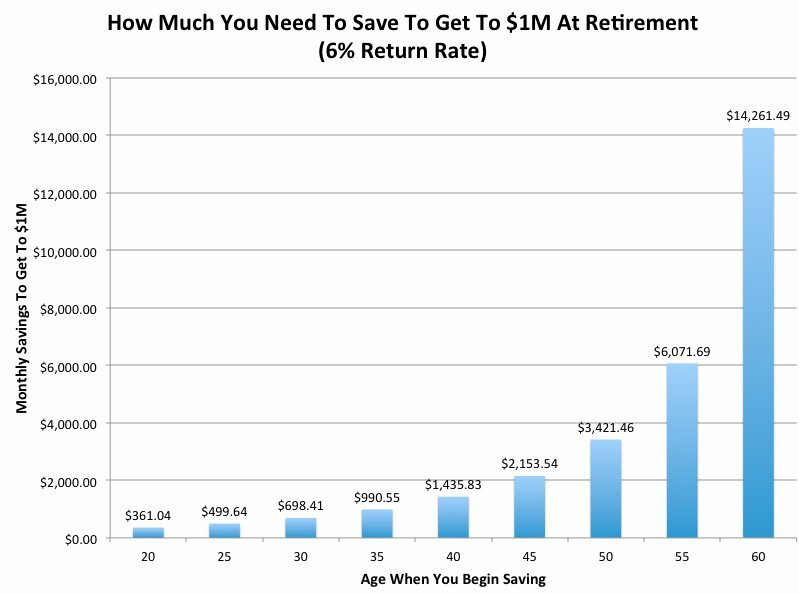 Wait until 65 and you have doubled your savings in 10 years. If you wait until you are older, you will have to save more each month in order to match the same numbers e.g. at age 40 you need to save $3500 a month to make that one million mark by the time you are 55. 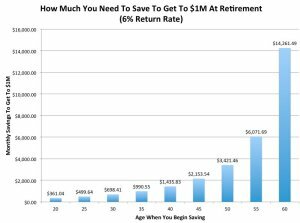 And if you wait until age 50, can you really save $15,000 a month? We have assumed a 7% return on average over the life of these savings. The stock market has returned this rate for many years. Although there has been a lot of volatility in that period with some years much higher and some years much lower. But people who consistently save their money and do not touch until retirement can easily meet this goal of one million dollars by the time they are 55 simply by saving $600 a month and becoming a retirement savings millionaire. This entry was posted in Retirement Planning and tagged Retire Rich on 2015/02/21 by ernie. If you are planning to retire soon and planning to manage your own retirement account, don’t go it alone. Get help with your retirement investing. Take an active part in all decisions. Most of us do not know very much about the details of the investments we have. We participate in a mutual fund which has a combination of stocks, bonds and cash. We leave it up to our financial adviser to recommend something to us. Then we rely on the mutual fund manager to manage the fund for us. It is a good idea to get advice from people who make it their business to understand the markets, the investment opportunities etc,. Someone has to pay them and that means you. Each time you buy a mutual fund, your adviser gets a kickback. The mutual fund manager charges up to 2% MER fees in Canada and somewhat less in the US. You make money only after they get paid. In a down year that can mean that your account actually loses money. One way to avoid all of these fees, which are ongoing each year is to purchase equities and corporate bonds directly within your investment plan. You will pay a trading fee initially, but that is the only fee you will pay until you sell the equity. The next thing to focus on is which stocks and which bonds. Use your adviser, do your own research and stay away from speculative and high risk stocks. In our opinion, consumers investing for retirement should focus on blue chip companies that have a long history of paying dividends and meeting the terms of their bonds. Better still is that these companies pay a dividend on a regular basis they also routinely increase the total dividend from time to time. The same applies to corporate bonds, although in their case the interest paid is usually fixed for the life of the bond. If it is a good quality company, then your risk will be relatively low. We should mention that nothing is risk free and that is why you want to invest in a diverse group of companies so that if anything catastrophic occurs, then your total nest egg is not in jeopardy. Seek guidance and advice from several people and them make your own decisions regarding the best approach to take with your Retirement Investing! If you worry about your investments and it keeps you awake at night, invest even more conservatively. You may sacrifice some income for less risk, but you will sleep at night. This entry was posted in Retirement Planning and tagged Investment Risk on 2014/12/21 by ernie. It is important to have goals and plans relative to your retirement. However we also know that action is more important than goals. Since many people have plans and never turn them into action. They never get started with their savings plans. They never seem to set up an automatic savings tool. Or they just have too many other money issues that they are dealing with. They just don’t get around to putting some money away. This can be one of the biggest mistakes that you might make in your life. It will have a significant impact as well. The quality of life you lead in retirement could be less than you expected or desired. You could end up working longer than planned, you might not be able to pay for health issues. You may have to live in substandard housing etc. The list goes on and on. Start early and you will have to save a smaller amount per week than if you begin in your late forties. It is more difficult to save when you are raising kids, paying a mortgage and a car loan. Starting later in life to save for your retirement means that you have to save a great deal more because you will not have the interest or dividend income to add to your savings in your younger years. This compound income can be worth more to you over the long run than all of the money you deposit. Start right now by taking 10% of your salary regardless of what it is and put it into a savings account. Keep doing this until you retire. Once you have enough money in the savings account to invest in an investment, transfer the money so that you get a better interest rate. Invest diversely and never place all of your money in one investment. The earlier you start, the larger the nest egg will be when it is time to retire. If you also have a pension, you will be well off and your savings can be considered a bonus to your standard of life quality. It is very tempting to draw on your retirement savings. Maybe there is a new car that is needed. maybe there is a down payment on a home, or major bills to pay, the kids education, etc. Unless it is a dire emergency, do not touch this money. It is your retirement money and will be the only thing that contributes to the quality of life you are planning. Once you take out the money, you lose the compounding of interest income and your overall savings plan will be less than it would have been otherwise. Get started now and set aside 10% of your paycheck now! This entry was posted in Retirement Planning and tagged Retirement Goals on 2014/09/21 by ernie. The baby boomers are retiring by the thousands. Some are retiring of their own free will, while others are being forced out the door. Some are taking up new hobbies. While others are following hobbies that they gave up while raising a family and following their career. There are many options and activities that consumers who are retiring can consider. We thought we would review a few of these in this post to provide readers with some ideas. If you are following a retirement plan or option that we missed, feel free to leave us a comment and we will add it to the list. 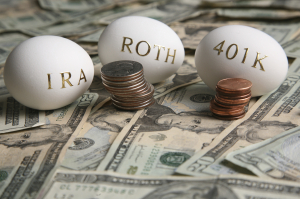 Retirement Planning Options – What to Do? Volunteer – a lot of people are satisfied financially, but they cherish helping and being with people. Volunteering meets these objectives and gets them out with other people of like minded ideals. Sometimes a volunteer position leads to a full time job. Start a New Career – you may have work in one industry, but have always wanted to try something different. Whether you retire on your own or are forced to retire ahead of their schedule, this is the time to follow and develop that new career. Start a small Business – some will begin a new business. There are literally thousands of small business ideas to follow and try out. Be careful to manage your money. Avoid sinking all of your retirement funds in a business that does not give the returns you are looking for. Look after the Grand kids – some parents help their kids by babysitting the grand kids. This keeps them active, they help out their own kids and they may even make a little bit of money out of the activity as well. 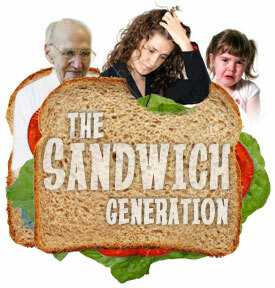 It is a great time to bond with their grand kids. 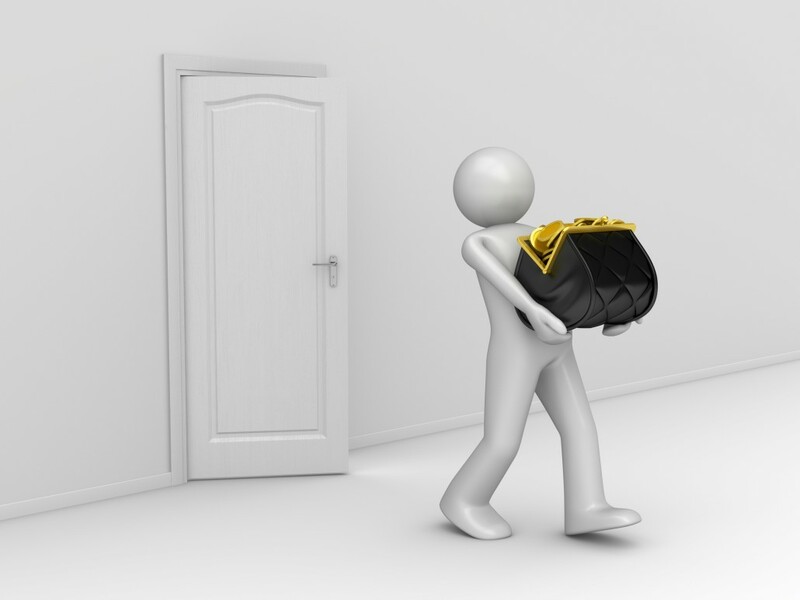 Work Part Time – is another situation that provides some extra money. It also keeps you in the work force and gets you out fairly often. You still have some time to do many of the other things we discuss in this list. Travel – can be expensive. However if you manage the travel costs, make it your job to find the deals and travel smart. You can virtually travel the world without spending a fortune. Don’t put it off, you never know when you will be forced to limit your travel due to health reasons. Focus on Hobbies – one person we know loved to buy small appliances, repair them and resell them. It was a hobby at first, but then it turned into a small business opportunity. Which helped to pay for his tools and some of his expenses. Focus on Your investments – if you have retirement savings, it is important to manage them, rebalance once per year or when major positions change, ensure that you are diverse in your investments and decide when to use the money during retirement. Help the Kids – everything from renovations, to helping the kids with moving and odd jobs around the house. Move to a New Location – many people will down size and move to another city to be near family etc. Although this is a short term project, it does take a lot of planning and organization to move from one house to another. Renovate Homes – buy a house at a low price, renovate it and resell it. This sort of project can be risky, however if you are a handy man at all, money can be made if you purchase a home at the right price, upgrade it and resell it. Work for your Kids – if your kids have their own business, why not work for them. You can choose to be paid or just help them out. Either way you will have lots to do and you get to spend more time with your children. Regardless of what you do it is important to have a plan. Some people will even start out with one idea and then switch to another based on their experience and enjoyment. Many will be doing some or all of the above at the same time. One thing we know for sure is that by taking up some or all of the above, you will never be bored or wonder what to do next. 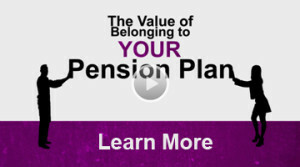 For more information about retirement planning, click here. This entry was posted in Retirement Planning and tagged Retirement Savings on 2014/03/21 by ernie. Get first decade of retirement right. Most people tend to spend more money than what they plan. As you get older, particularly after age 74 there is a tendency to spend less money, even when healthcare costs are taken into account. As you get older there’s less opportunity to spend your money and most people will save it with the intention of giving it to their children. Consumers must also decide when they’re going to take their old age pension. If you wait until you’re 65 you will collect the maximum, or at age 67 with the new laws that are in place you will then collect your maximum. If you take your pension earlier there will be a penalty as much as 30%. Deciding how you’re going to handle your investments and make up for that loss of 30% is a particularly difficult issue for many people. The longer that you can delay taking your pension the more money you will have. If you can also work longer, or reduce your expenses to ensure that you have sufficient money to live on while you’re retired this is also a positive thing to do. Delaying taking your pension will decrease that 30% penalty and if you can wait until your age 65 or 67 you will have no penalty at all and will increase your overall pension income by 30%. All of these issues are important to take into account while you’re planning your retirement income. Note all of the income that you will have from pensions, government and employee pensions, and also your investment income without having to touch the principal. If the combined income is sufficient without having to touch the principal and you’re in a good position. If however you must start withdrawing principle you must take into account and plan for the future well into your 70s and 80s to ensure that you will have sufficient income. You must also take into account the stock market will be volatile and will be significantly up one year and could be significantly down the next year by as much as 20 or 30%. If you are withdrawing principle when the stock market is down by as much as 20 or 30%, this can really eat into your overall savings and decrease the chance of your savings last your lifetime. Do a risk analysis on your portfolio and assume a 20% decline in the stock market to assess whether your plan will last your lifetime. If your principal will not last your lifetime, you should probably consider taking less money out of your plan each year and making up the difference with either spending less, getting a job or selling some other asset. The first years of retirement can be very difficult and critical in terms of ensuring that your investment plan will last your lifetime. get it right and you’ll be very comfortable, get it wrong and you will not have as comfortable a retirement as you had hoped. 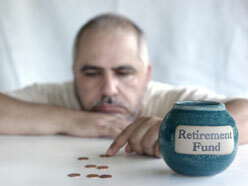 Get first decade of retirement right and more information about retirement planning click here. This entry was posted in Retirement Planning and tagged Retirement Savings on 2014/01/07 by ernie. Prior to retiring you may have focused on your financial plan. You wanted to make sure that you have sufficient money set aside to lead a comfortable retirement. Your focused on the quality of life that you would like to enjoy. However there is much more to retirement planning than just making sure you have enough money to last through your retirement. Although it is an extremely important part of your retirement there are a couple of other elements that are important that will lead to a satisfied high quality of life during retirement. These include assessing those factors that are important to you for a quality of life experience. For example what will you do in your spare time? Most people will have from 8 to 10 hours of new time that is now available to them. This includes eight hours of work an hour lunch and an hour for commuting. Now you all you have to do is go down to the breakfast table have breakfast in the morning and then decide what it is you’re going to do for the rest of the day. Some people spend their time organizing their life and trying to schedule everything they can into their 8 to 10 hours of time. Others develop or reestablish hobbies, volunteer, travel, get a job, work on projects etc. What will you do with your time in the short term as well as the long term? Is important to get a perspective on what your time is available to you and how valuable it is to you. For example many people will spend time fixing and repairing those things around the home that they may have neglected. You may set up small projects etc. or plan on volunteering. Going for coffee with ex-work employees and meeting up with various people who you enjoy spending time with. It is also important to take stock of what your planned retirement life will be like both before you retire and then six months after you retire. Are you still enjoying and appreciating the life that you now have? 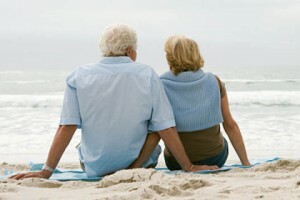 Is it the quality of life that you would like to have during your retirement? If you cannot answer yes to some of these questions then it is time to take stock and reevaluate your retirement quality-of-life plan. Make changes that will improve your quality of life and achieve some of the objectives that you’re looking for. Don’t put these things off, you never know how much time you actually have. One last point, whatever your plans will be, they also must be balanced with the level of income that you also have available to live the life you are looking to have. Making adjustments through out your retirement is an important step toward ensuring that you enjoy your retirement in all of the years that you have. This entry was posted in Retirement Planning and tagged Stress Test Your Budget on 2013/11/30 by ernie. Even the most basic plan will help you understand what your situation would be during your retirement. Plan for retirement success to avoid surprises. The most basic plan looks at your income during retirement. Also your anticipated expenses during retirement. The expenses are those you assume should be the average daily or monthly expenses that you would expect to have during your retirement years. You should also add in expenses for extraordinary things. Such as: weddings, health issues, downsizing, and any special events that could take place during your retirement years. Assume taking 4% of your savings each year as income to assess whether you have sufficient savings. This is a simple method. There are more complex approaches, however you can get started using the 4% rule. If you develop your retirement plan early enough it allows you to take the appropriate steps to ensure that you have sufficient savings. If you wait until your late 40s or early 50s, to develop a retirement plan you may get some nasty surprise. Which suggests that you must work much longer than you anticipated. If your objective is to retire at 55, a retirement plan that starts when you’re 25 can easily attain this objective. If you have no plan and you’re already at 45 the chances of retiring at age 55 are remote. It is difficult to know unless you fall into an inheritance or have a large lump sum of money available. Those people with a plan will tend to save more money towards a retirement than anyone who does not have a plan. Having a plan means that you’ve thought about retirement. You have thought about what you need to do to accomplish the quality of life you’re working for while you are retired. You do not even have to have a financial adviser to develop your own retirement plans. Keep it simple, make assumptions about your income. Make assumptions about your savings, Make assumptions about the amount of interest and capital appreciation that you will achieve in your savings plan. With these basic assumptions the majority of people will have more than sufficient income and savings while they are retired. 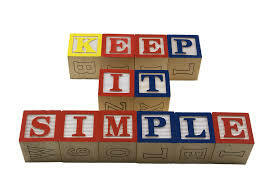 Keep it simple. Consider all of your expenses to maintain your home, your utilities, holding, food and entertainment. If your home needs some updating such as new windows, new roof, new furnace or of some other maintenance activity you will need to factor that into your savings plan and your retirement plan. The next most important thing is then to set a budget for your daily expenses. Also most important your savings plan. Starting early will ensure that you will have more than sufficient income. You will be able to live the quality of life that you and your spouse had planned for. For more information about retirement planning, click here. This entry was posted in Retirement Planning and tagged Retirement Plan on 2013/10/31 by ernie.